Well, we are coming to the end of our set of Beyond Bums product reviews (though don't forget tomorrow night on Facebook is the live gala where you can have a shot at winning all of these great products for yourself!). I'm very pleased to end the week with a bang and with our GRAND prize from My Precious Kid! My Precious Kid operates as an online shop as well as a brick & mortar store run out of Hillboro, Oregon. Kay Green, owner & founder, is celebrating their 10th year of business this month! She began this child safety shop ten years ago after her fourth child, her adopted daughter, Haley (10), joined their family. As a mother to four children, Kay saw the need for a variety of products in their own family and decided to start offering them to other families as well. Starting up with humble products like ID cards and kits to help keep children safe, My Precious Kid quickly burst into the Child Safety scene, adding products to its inventory constantly. My Precious Kid's primary mission is to keep children safe and educate parents on child safety. As their slogan says, they "Make Child Safety Easy". They carry over 1200 products in 11 product categories including: child safety, child proofing, safety education, baby gear, safe sleeping, safe baby gifts, and cloth diapers (their cloth diaper selection alone is very impressive!). Every product that they carry in their store has been personally tested either by Kay herself or by family and friends. They pride themselves on only selling products they believe in. When they made the decision to add cloth diapers in 2010 to our Hillsboro Oregon location, Kay's granddaughter, Emma Kate (born in the fall of 2010), became their official diaper tester. Kay now has four grandchildren in total in addition to four children of her own (ranging in age from age 10-28), and child safety continues to be her passion. She hopes to see My Precious Kid continue to grow and become a household child safety name over the years to come! So, all in all, I am very excited to partner with Kay and My Precious Kid in reviewing our final and grand prize product of the Beyond Bums event! 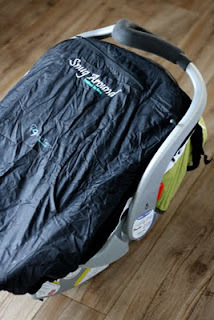 I was fortunate to have the opportunity to review the Anaya Papaya "Snug Around" Baby Carrier Cover! 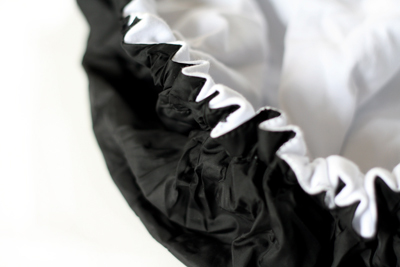 This great product is extremely versatile, doubling also as a nursing cover, carseat cover, and stroller blanket in addition to its main roll as a baby carrier cover. Think of it as a baby windbreaker of sorts! You know how hard it can be to dress an infant in layers and jackets, especially in the chilly winter or sloppy spring. In fact, I think I received this cover at the exact perfect time of year, when rain and sleet and wind were helping to transition us from a long, cold winter to a bit of a dismal spring. I've been wanting to get out daily with Baby Aurelia, but sometimes a sweater and blanket just weren't cutting it on our walks (the wind would toss them aside or cut straight through them, or they would quickly grow damp walking in the rain on our way to the car). I loved it as a carseat cover! The Snug Around also has several other little fastners that can help to cinch it in to the perfect tightness or shape, or that can tie onto carseat or stroller handles if need be. 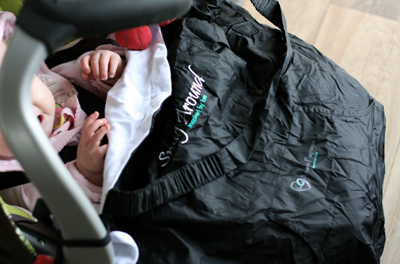 It's big enough to cover the entire carseat opening (without smushing down onto the baby's face like some covers that seem too small) but can also be worn/folded down as more of a blanket-style cover for larger babies who want to look around while going for a walk. Of course, the primary function of this cover is for use over most mainstream baby carriers. Sadly, we have never been fortunate enough to be able to get a fancy baby carrier (usually a humble sling carrier or my own two arms have had to suffice), so I didn't have the opportunity to try this out with a baby carrier this time. However, in looking over the photos that came with the packaging (and that are also shown here), it's evident that the Snug Around gets it best use and fit when used over most modern baby carriers. 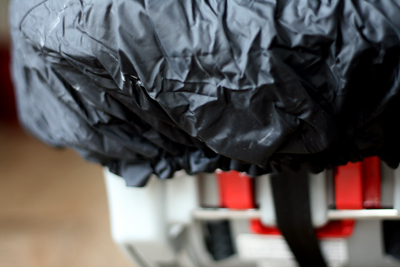 It works with Ergos, Bobas, and Bjorns whether your little one is forward or rear-facing. I wish I had had this product in the fall, when Aurelia was teeny tiny, and I would walk around with her in the yard in a Snugli that had been loaned to me for the time. I was always concerned that the wind was making her too cold, so I would dress her in ridiculous amounts of layers before trying to wedge her into that tight little Snugli, then wrapping her in my jacket or in a tethered-on blanket once we were outside walking or playing with the dogs. Having this Snug Around would have left my arms free to do so much more while outdoors (rather than holding a blanket tight around her back to shield her from the wind!). As someone who loves walking in dog parks or along the river valley, I think this is a great product. And, as Baby A keeps getting heavier and heavier these days, we still hope to get a carrier someday soon, and I can't wait to actually use the Snug Around once we get one! If you are wearing the Snug Around on a carrier (or as a nursing cover, which it can also be used as when out in public! 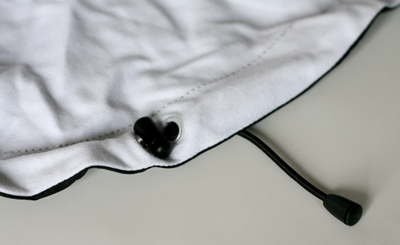 ), it also has a couple of great pockets & pouches on its front, replacing the need to keep things in your jacket pockets if they are obstructed by the baby. I always keep a couple of cloth wipes stowed in here and have been known to sneak my iphone into the zip pocket when I need a hand or two free as well! Overall, at $44.99, I think this product is a great value considering it has 3 or 4 different uses in one. More than the good price, I love that it can majorly reduce the amount of stuff I have to haul around in my diaper bag. I can totally remove my other nursing cover, which took up a significant corner of my bag, and just keep this Snug Around on the carseat or tucked in the stroller basket and know that I have a nursing cover, carseat & carrier cover, or stroller blanket all in one--no need to haul 3 or 4 bulky items with me just for a short day trip! Thanks to Kay from My Precious Kid for this wonderful item to try. It's always neat to see what you'll source out next for your vast shop of handy, functional, and safety-conscious baby goods! 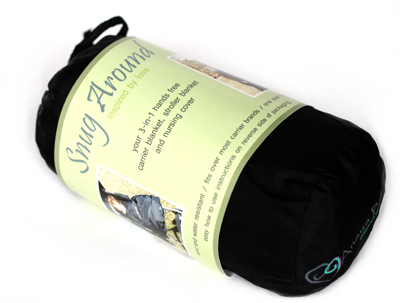 BUY IT: Visit My Precious Kid to purchase the Snug Around cover for only $44.99! You can also visit My Precious Kid on Twitter or at their blog.